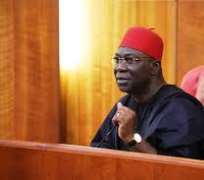 Deputy Senate President Ike Ekweremadu has refuted rumours being bandied about in some quarters that he is nursing an ambition to be governor of Enugu State in 2015. Ekweremadu said he had made his position on the rumour that he was eyeing Chime’s position known severally even though people were not ready to let the matter go. The Deputy Senate President, who has been in the Senate for a record time of 12 years, also allayed fears of the possible defection of senators elected on the platform of the Peoples Democratic Party (PDP) to the All Progressives Congress (APC), as witnessed in the House of Representatives. In the House, 37 lawmakers of the ruling party have defected to the opposition party to whittle down on the numerical lead of the ruling party to only a pencil mark difference. In his view, the upper chamber is more compact and would not encourage any defection at this critical time. Ekweremadu urged the people of the South-east zone and the country at large to support the federal government in its efforts at tackling the myriad of socio-economic and security issues. According to him, the South-east has never had it so good under any administration as they do under the Jonathan administration, since the nation's independence. He, however, did not outline the advantages being enjoyed by Southeast zone under this dispensation. On the creation of more states, especially Adada State that people from Nsukka zone of Enugu State are agitating for, he explained that people should be patient as the process was a tedious and rigorous one. He, however, added that people should not think that as the chairman, Senate Committee on the Review of the 1999 Constitution and an indigene from Enugu State, that he had overriding powers to ensure that Adada State is created. 'You know that the Senate Committee on Constitutional Review is made up of one person from each of the states of the federation, so I am only privileged to chair that committee. So the decision of that committee was unanimous on the fact that by the time we submitted our report that none of those requests met the criteria. 'And one of the major problems they had was the issue of the signatories. Some of these signatories were those who were in the parliament prior to this time because the constitution is emphatic that it has to be those who are in the parliament by the time the request is being made. So, it means it has to be current parliamentarians not parliamentarians that were there in the past. This was one of the reasons our colleagues rejected them and we advised that what they needed to do was to update this request and re-present to us. 'And as I speak to you, we have seen a number of representations and we are very happy about that. Regrettably for the one for Adada, I was told that the group that was in charge of this state request that they were advised to rather go to court for the court to compel us to recommend them for referendum. Well, I don't want to make so much comment on that because it is sub judice, that matter is already in court. So, I just wish them good luck. If the court compels us, we will be happy to do that but if the court doesn't, we hope that they will come and do what others are doing by representing the request. That's why we have not received the request from Adada because I understand that they are in court,' he said. The Deputy Senate President is not shaken by the crisis rocking the PDP that has led to the series of defections. Ekweremadu said the party would never be a minority and described what was happening as the beauty of democracy. He urged Nigerians not to be in a haste to write the PDP off in view of the defection of five of its governors, noting that efforts are being made to ensure that the governors returned to the party. Ekweremadu said if they refused to return to the PDP, the party would work hard to secure more states in the next elections.